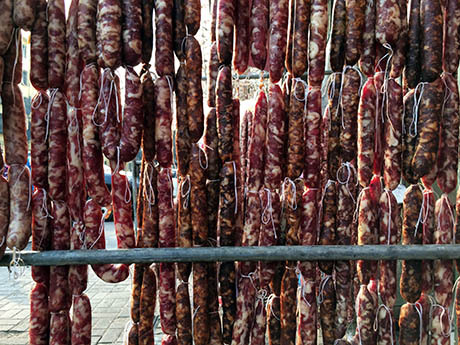 IMAGE: A wind-dried sausage curtain, Zhengzhou, China. Last spring, I applied for the inaugural UC Berkeley-11th Hour Food and Farming Journalism Fellowship. I was very happy when I got the email saying I was one of six Fellows chosen for 2013—but, as it turns out, not nearly as happy as I should have been. The Fellowship, which involves two workshops and comes with a $10,000 grant, has been the single best experience of my writing career. The workshops, with my five fabulous fellow Fellows, Fellowship director Michael Pollan, managing editor Malia Wollan, and a series of superstar guests, including author Jack Hitt and New Yorker senior editor Alan Burdick, were fun, inspiring, extremely helpful, and also (this is Berkeley) exceptionally well-catered. To have that many smart people in the room all completely invested in the success of your story and enthusiastically working with you to make it better (and sell it!) was an enormous boost. Thanks to their help and advice, and to the $10,000 grant, I was actually able to spend the first three weeks of this month in China, reporting a story for The New York Times Magazine—of which more soon (my deadline is March 1). I say all of this because applications are now being accepted for the 2014 Fellowship, which has been expanded to eight Fellows and to include radio journalists as well. If you want to write a long-form story on any aspect of the food system, this is your golden ticket. Apply!